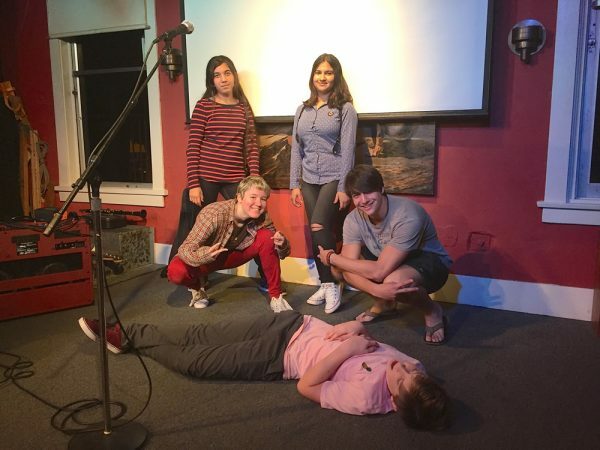 – Music In Common participants take a break from songwriting before their performance: standing, Amina Akbarzada and Athraa Alsraihat; kneeling, Rylee Bullington and Max Fruman; floor, Wyatt Beckley. Photos by Todd Mack. Surrounded by art in the dimly lit main showroom of BC Space Gallery, six teens circle and contemplate lyrics on a screen. Yesterday, they were strangers just beginning to get to know one another. Today they are all songwriters and friends. They come from different religious, ethnic and cultural backgrounds—and from different cities within Orange County. Four were born in the United States, two emigrated here from foreign lands. These teens and one other converged in Laguna Beach earlier this month. Todd Mack brought these kids together to “wage peace” and promote mutual understanding. The founding executive director of Music In Common, based in Sheffield, Mass., he asks the students to assess their own lyrics – a chorus and two verses – and make any last-minute revisions. Mack founded Music In Common in 2005 to honor his friend Daniel Pearl, the Wall Street Journal reporter abducted and murdered by Al Qaeda in Pakistan in 2002. The organization’s mission is “to strengthen, empower and connect communities through the universal language of music.” Laguna Beach radio show host Jason Feddy met Mack in Israel during the Friends of Danny Festival, which Mack calls Music In Common’s flagship concert. With Mack’s help, Feddy and Laguna Beach songwriter Alisa Eisenberg brought Music In Common to Orange County in 2015. Feddy and Eisenberg used social media, their own contacts and partnered with Santa Ana-based Tiyya Foundation, which supports refugees, to create a group of diverse participants. The Music In Common experience usually lasts a weekend, with getting-to-know-you discussions and the majority of songwriting taking place on Day 1; performance on Day 2. This time, the organizers seized the opportunity for a three-day workshop, beginning with the observance of Veterans Day, Friday, Nov. 10. Prior to the songwriting weekend, participants are asked to respond to thought-provoking questions. The students are asked to identify a recent current event that made an impact on them. They are asked to describe any pressures they have experienced both from within and outside of their faiths and communities. Lastly, the questionnaire asks what they would share with the world if they could. “The first day was a little tiring. There was a lot of talking,” says Athraa Alsraihat, 14. Now a drama student at La Quinta High School in Westminster, Athraa, originally from Iraq, has been in the United States and speaking English for little over one year. During the songwriting session, her large brown eyes look for opportunities to connect. Come Sunday, Nov. 12, she will sing the second verse solo. Koby Taswell plays clarinet as Jason Feddy records. The teen took part in Music In Common, an intercultural songwriting experience, earlier this month. Still, the discussion on Day 1 was important, Athraa says. After getting to know her fellow songwriters, Athraa describes them as “friendly” and “fun.” Her friend, quiet and demure Amina Akbarzada, 14, nods in agreement. Amina is from Afghanistan originally and has only been in the United States half a year longer than Athraa. She, too, attends La Quinta High and sings in its choir. During the Day 1 discussion, 18-year-old Koby Taswell, a student at Saddleback College in Mission Viejo, referred to comments made by President Trump during a recent trip abroad. The comments, taken out of context, implied that the president was unaware that Japanese auto makers operate plants in the U.S.
“It left me with a lasting impression about the world today. It’s a world in which people speak first instead of thinking and discussing facts,” says the teen. Back at BC Space Gallery on Day 2, Mack gently urges the young songwriters to commit to their lyrics. “We’re running out of time,” he says. 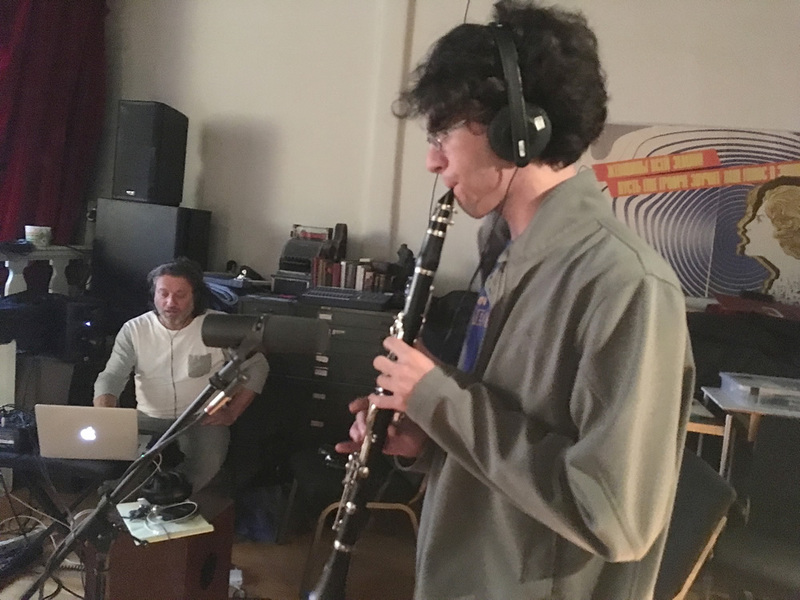 Koby, who will play clarinet during the group’s performance, asks about a specific line in the second verse, penned by guitarist and Laguna Niguel resident Max Fruman, 17. The line refers to a journey, Max says, adding that each person interprets their journey differently. “Bad or good; it’s your choice. That’s what’s cool about it,” Max says. Laguna Beach resident Wyatt Beckley, 13, adds that the verse is “kind of bittersweet.” Wyatt co-wrote the chorus with Koby. 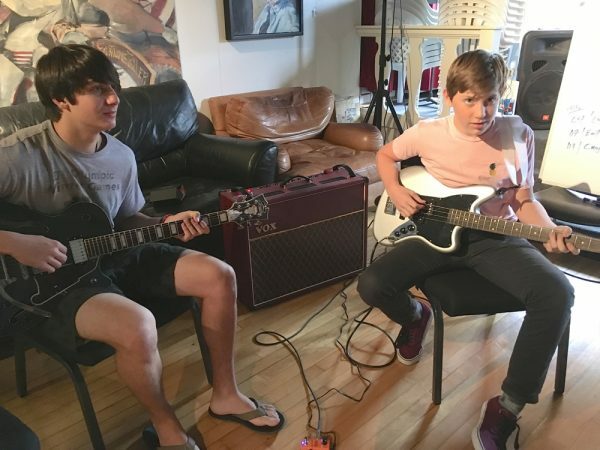 – Max Fruman and Wyatt Beckley practice “One Big Tree,” an original song they and five other teens composed together. “Is this your song?” Mack asks. Silent but for an occasional strum of guitar or ukulele, the teens contemplate. Mack then addresses Amina and Athraa, huddled over a drum, yellow notepads and pens in hand. Athraa gives her approval. “It sounds good,” she says. The night of the performance, the teens draw a modest crowd of 20, mostly family members and close friends. Mack acknowledges the weekend’s sponsors, including the city, Festival of Arts Foundation, Tiyya, BC Space and others. After a brief video describing Music In Common and its goals, the six teens present are joined by a seventh, Amr Moussa, 19, who plays violin. An immigrant from Syria, Amr arrived in the United States when he was just 3 years old. He lives in Anaheim Hills. Music In Common will return to Laguna Beach in Feb. 17-19, to present JAMMS, Journalism as Music, Multimedia, and Songwriting. are added- checkbox and now whenever a comment is added I recieve four emails with the same comment.